Physicists in Germany are the first to transmit quantum information from a flying aircraft to a ground station. The sender and receiver were separated by about 20 km and the aircraft was travelling at nearly 300 km/h. The team says that its demonstration shows that it should be possible to exchange quantum information between ground stations and satellites – something that could lead to wider use of quantum cryptography. In the last decade or so, quantum cryptography has gone from theory to a commercial reality, with systems available from several companies. The most popular quantum-cryptography technique is quantum key distribution (QKD), which allows two parties to exchange an encryption key secure in the knowledge that the key has not been read by an eavesdropper. This guarantee is possible because the key is transmitted in terms of quantum bits (qubits) of information. If intercepted and read, such qubits are changed irrevocably, thus revealing the actions of the eavesdropper. Optical photons are ideal for distributing quantum keys because they can travel long distances through an optical fibre or air without significant degradation. Indeed, physicists have already managed to send quantum keys across distances of 144 km through the atmosphere between two fixed ground stations. Even greater distances have been achieved using optical fibre. Now, Sebastian Nauerth and colleagues at Ludwig-Maximilians University in Munich and the German Aerospace Centre in Wessling have transmitted quantum information from a moving aircraft to a ground station. 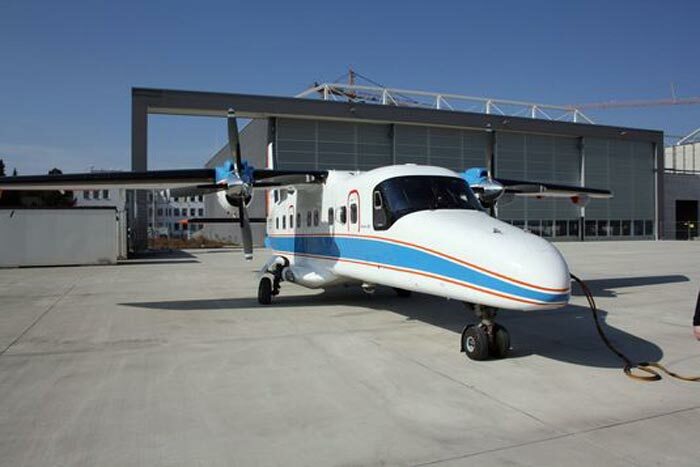 This was done using a Dornier 228 turboprop aircraft and an optical ground station in Wessling. Both are normally used by German aerospace researchers to investigate laser-based, air-to-ground communication. The team modified the transmitting equipment onboard the aircraft so that it emits pulses containing just one photon each. To boost the number of signal photons that reach the ground station, the angular divergence of the transmitter was reduced from 2.6 mrad to 180 µrad. However, even with this tight aperture the pulses diverged to a diameter of 3.4 m after travelling 20 km. To compensate for mechanical vibrations and other noise, the link was stabilized using fine pointing assemblies (FPAs) – which are used to stabilize conventional laser-communications systems. An FPA at one station detects light from a beacon at the other station and ensures that the transmitter (or receiver) remains pointed in the right direction – despite the motion of the aircraft. Quantum information is encoded in the polarization state of the transmitted photons. When both transmitter and receiver are land-based, the direction of polarization is fixed. An aircraft however, can rotate relative to the receiver – causing the polarization measured by the receiver to vary. To correct for this, the team developed a motorized polarization controller. Quantum transmissions were performed shortly after sunset as the aircraft followed a nearly circular path about 20 km away from the ground station at Wessling. The team managed to send quantum keys from air to ground at a bit rate of about 145 bit/s. As well as showing that air-to-ground QKD can be achieved in spite of the noise introduced by turbulence and engine vibrations, the experiment also establishes that existing laser communications systems can be adapted for quantum cryptography. "This demonstrates that quantum cryptography can be implemented as an extension to existing systems," says Nauerth. While engine vibrations are not a problem for satellites, the team says that other challenges overcome by the research such as tracking a fast-moving transmitter across the sky bring satellite-based QKD closer to reality. There is more about quantum communications involving satellites in the March 2013 special issue of Physics World on quantum physics.